The company behind the hybrid London black taxi will join the panel van market in 2019, with a petrol electric one-tonne commercial vehicle. The London EV Company (LEVC) will build the new medium sized petrol hybrid van at its Ansty plant in Coventry, alongside the TX black cab. The production line will support over 1000 local jobs and be part-funded by a £300 million investment from LEVC’s Chinese owners, Geely, who also own Volvo. The UK Government has also reportedly invested several million in the venture. 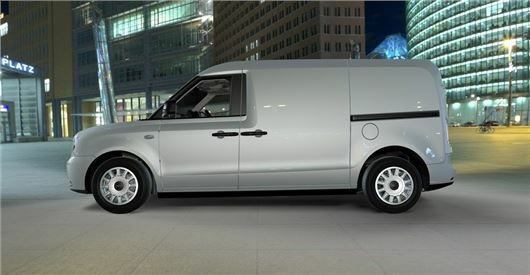 There are no details on the one-tonne van's specification or price, but LEVC has promised to deliver 'a competitive total cost of ownership' and class leading safety systems as standard. This means the medium sized panel van - which is yet to be given a name - could borrow semi-autonomous tech from Volvo's range of passenger cars, with automatic emergency braking, blind spot monitoring and driver fatigue monitoring fitted as standard. An autopilot function that will control the vehicle's speed and lane guidance on the motorway could also make its way into the van. Unlike the latest electric Mercedes-Benz eVito, which is designed to cater for 'last mile deliveries', with a sub-100 mile plug-in battery range, the LEVC van will be designed for those who cover large distances on a daily basis. The powertrain of the van will mirror that of the TX black cab, with a 1.5-litre turbocharged petrol engine mated to a motor and battery pack to provide an all-electric range of 80 miles with zero emissions. Combined the petrol engine and electric battery pack will provide 400 miles. LEVC has told Honest John Vans that road trials will start in 2019, and it is already in advanced discussions with a number of major public-sector fleets about supplying prototype vehicles. This includes the Metropolitan Police Service and the London Fire Brigade.